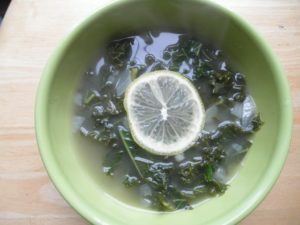 Kale Soup with Rice and Lemon Makes 4 servings The bright touch of lemon in this soup is like a little ray of sunshine on a winter’s day. The soup also manages to be hearty without weighing you down. Unlike most soups, which taste better the next day, this one is really best the day it’s made. In a large saucepan or soup pot, heat oil over medium heat and add onion, cooking until translucent, 5 to 6 minutes. Add broth, kale, rice, lemon juice and zest to onions in soup pot. Bring to a boil, then reduce heat to low. Cover and simmer 30 minutes or until rice is tender. (Add more water or broth, if needed.) Season with salt and pepper. This recipe is from my book, The Inflammation Free Diet Plan (McGraw Hill, 2006). Enjoy it and feel free to link to it but please do not reproduce it. For more anti-inflammatory recipes, visit InflammationFactor.com or pick up a copy of The Inflammation Free Diet Plan.